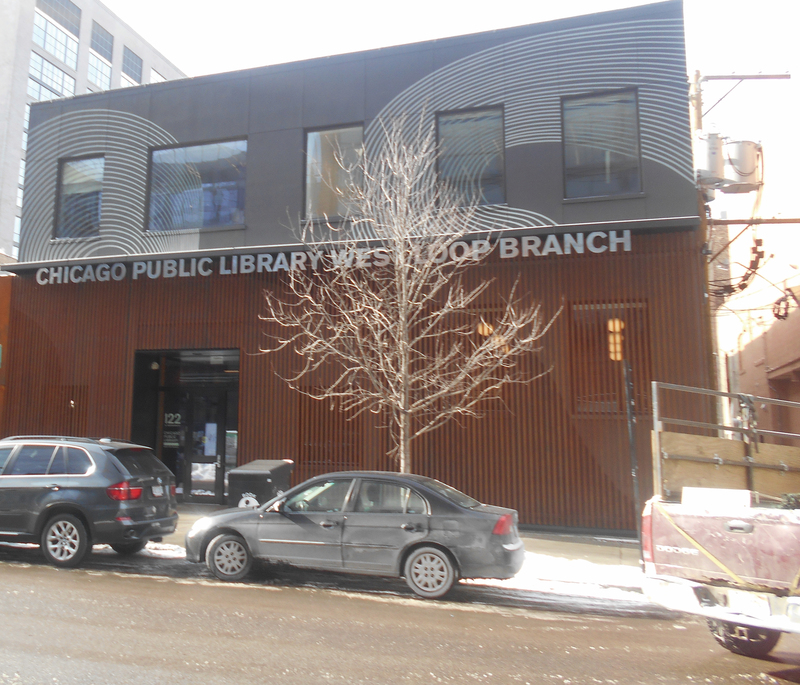 It’s not often that the Chicago Public Library system opens a new branch library. Since 2011, there were several instances when the existing branch libraries moved to different buildings, but Jan. 17 marked the first new branch in the past eight years. It is located in the West Loop neighborhood, the traditionally industrial portion of the Near West Side community. As the neighborhood became increasingly residential, the demand for a local library grew. The new branch library has many features common in newly refurbished locations, with high-tech equipment, larger children’s areas, more spaces to use laptops and more meeting rooms. The residents who spoke to the Chronicle said they enjoyed the design, and they liked having a new gathering place for their children. The Chicago Public Library system grew out of the single library that opened its doors in 1873. As the city expanded, residents wanted to be able to check out books without traveling all the way to the Loop. The system changed a great deal over time, with branches opening, closing, moving locations, downsizing and expanding. Today, the system is made up of the main, nine-story Harold Washington Library, two regional libraries and 78 neighborhood branch libraries. The branch buildings tend to vary a great deal in terms of age, size and amenities. While most neighborhoods have at least one library, there are several neighborhoods that have none whatsoever. Blackstone library, of South Side’s Kenwood neighborhood, is the oldest branch library in the system, operating from the same building since 1904. Until this year, the newest branch library was the Dunning library, of the eponymous Far Northwest Side neighborhood, which opened in May 6, 2011. Since then, several branch libraries — Chinatown library, Albany Park Library and Edgewater Library — moved to larger, more modern buildings that either replaced the existing buildings or were located somewhere nearby. At that point, there was already demand for a West Loop branch library. The Near West Side community area already had two neighborhood branch libraries — Roosevelt branch library, which traditionally served Little Italy, and Manning library, which serves the “West Haven” area around the United Center. What is now known as West Loop has been mostly known for factories, warehouses, meatpacking plants and wholesalers — so putting the library there wasn’t a priority. But during the 1990s, artists started to move in, attracted by cheaper alternatives to increasingly expensive River North. As the Near West Side gallery scene grew, the neighborhood became more fashionable, and by early 2000s, redevelopment began at its earnest. While during the mid-2000s, much of Fulton Street was still the domain of food processing businesses, it wasn’t long before many of them either closed up or moved out. As the neighborhood became more residential and many of those residents started families, the interest in a local library grew. CPL worked with Sterling Bay, which owned a number of properties in the area, to find a location. The developer wound up donating an office building at 118-122 N. Aberdeen St., which was previously part of Oprah’s Harpo Studios complex. According to the City of Chicago press release, the project cost a total of $2.3 million, $976,000 of which came from private donations and funds from the city’s Neighborhood Opportunity Bonus fund, which uses fees developers pay to build taller than they would normally be allowed near downtown. Iconic Chicago firm Skidmore, Owings & Merrill redesigned the building. As the CPL press release notes, the interior was designed to pay homage to the neighborhood’s industrial history, with exposed brick walls and beams. The building renovations ran through 2018, with the grand opening held on Jan. 17, 2019. The end result is a two-story building, with the second floor about half the size of the first. The first floor is divided into two halves — a general area to the left of the entrance and the children’s section to the entrance’s right. The latter is about half a story higher than the former. 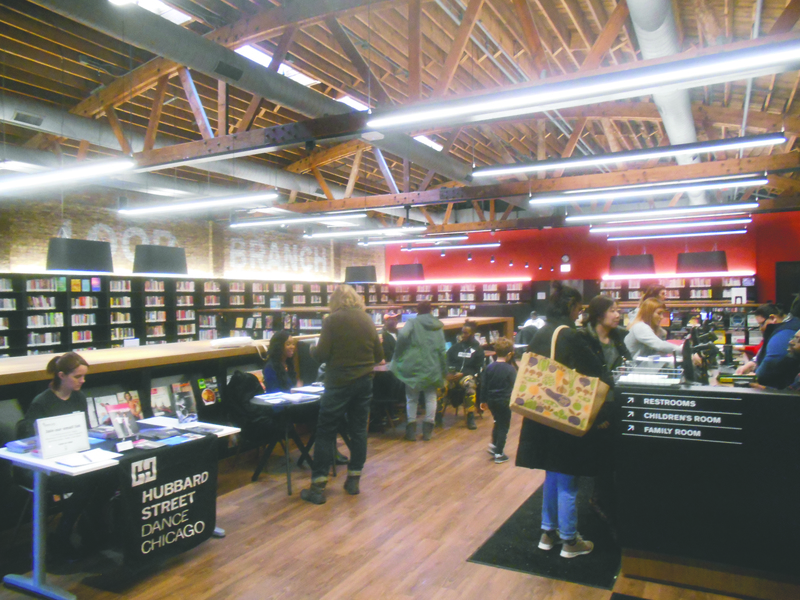 As has been the case with many renovated branches, the West Loop branch has a small “YOUmedia” area — a teen-orientated multimedia space. This library’s YOUmedia space comes with a 3D printer, a vinyl cutter and a computer gaming system. The general area has some amenities of its own. As with other newer and recently renovated branches, there are plenty of power outlets. It also comes with a shelf’s worth of board games, sitting nooks tucked between selves and some tables. And, as a recent visit to the library demonstrated, the lobby has plenty of room for strollers. 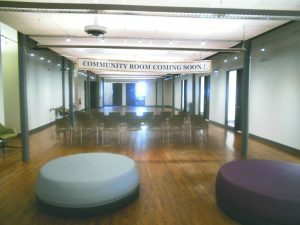 The second floor includes five study rooms, two larger meeting rooms and a room specifically designated for library activities wrapping around a larger common area that can be used for performances and community events. While not all study rooms were fully furnished at the time of the visit, the idea seemed to be for each room to have a desk, at least two chairs and a whiteboard. The study rooms can be reserved online by any patron. “The new West Loop library branch is a proud example of how city officials come together with private partners to build strong neighborhoods, and provide a place for all community residents to gather, share and succeed,” he said. Ald. Walter Burnett (27th Ward), whose ward includes much of the West Loop, offered special praise for the library’s technological features. January was an auspicious day for branch library ribbon-cuttings. Whitney Young Library, of South Side’s Chatham neighborhood, reopened on Jan. 10 after extensive renovations. 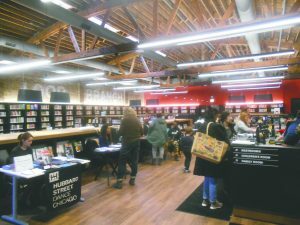 Independence Library, of Irving Park moved to a new, larger space on Jan. 22, a little more than three years after a fire gutted its previous storefront location in 2015. On the same day, Roosevelt Library — now renamed “Little Italy Library” moved into a larger space. The latter two buildings stand out because they were part of the collaboration between CPL and Chicago Housing Authority to build new mixed-use buildings that would have the library on the first floor and affordable apartments above them. In addition to the grand opening, the library held a Family & Community Day on Jan. 26 to introduce local residents to what the branch had to offer. Local community organizations talked about what they had to offer, and families could watch performances and take part in various arts-and-crafts activities. All the patrons who spoke to the Chronicle — including several who declined to comment on record — said they enjoyed the new library. “For us, it’s all about where kids go, and maybe now my books won’t be late,” she said. Taylor said that their previous go-to library was the Harold Washington Library, which, she said, “was very hard to get to in the winter,” especially with kids. Jenny Tolie, another parent, said her go-to library was the Roosevelt library. Like Wallace, she said it was a great place for kids to meet their friends. Kelvin Wallace was one of the patrons taking advantage of the table with the built-in power outlets, also gave a positive review.